Pie shops are hot on the heels of cupcake stores in the every-neighborhood-must-have-one stampede. They’re popping up all over town, and the latest to debut is PIE, a homespun space in Fremont where owners Jess Whitsitt and Renee Steen specialize in handheld minipies. 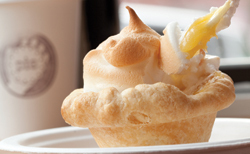 That’s where you’ll find this fluted-edged lemon meringue beauty ($4.50). The crust is flaky, but the addition of graham cracker crumbs to the dough gives it a satisfying heft. It cradles a pool of almost-too-tart lemon curd wearing a fluffy cap of toasted meringue. It’s like sunshine under a little cloud. And it’s also available in a precious mini-mini size ($1.75). 3515 Fremont Ave. N, Suite B; 206.436.8590; sweetandsavorypie.com.